I have a huge backlog of things to write about including the dead (an old burial road) and circuses (the greatest show-woman) because when I’m looking for one thing, I inevitably seem to find another. Case in point: Last week I went to see if there was anything left of a burial mound known as Offlow and ended up at Shenstone pondering 19th century funerary art. Offlow: the short answer is there is nothing left. Shenstone: So much going on with this 16 year old woman’s grave. Look at the tiny tools! I have no idea why my kids are ashamed of me and have me blocked on Twitter. To show solidarity with my GCSE-sitting son, I have decided to show my working out. Or not working it out, as is probably more accurate as I want to share the things that have me stumped, the dead ends and the ‘not quite sure about this but maybe someone else will be able to help’ type stuff. Whether it’ll lead to quantity over quality or prove that a picture is worth a thousand words remains to be seen. With that in mind, I have two sheds for your consideration and comments. Firstly, one spotted in a field on a walk around the lanes of Fradley, in the village proper rather than the site of RAF Lichfield. My best guess is that’s where it originated though, with the windows suggestive of an accommodation block. I imagine it was relocated here after the airfield closed in 1958 and re-purposed, although what for I’m not sure. Tonight’s second shed is this ramshackle affair spotted alongside the disused Walsall to Lichfield railway line in-between Sandfields Pumping Station and Fosseway. My best guess for this one is that it’s a platelayers’ hut where chaps working on the track would store tools and take shelter. As with the rest of the line, it’s slowly being reclaimed by nature which is sadly ironic given that the platelayers were responsible for keeping their stretch in good working order and free of vegetation. I’m hoping this new approach will be as effective at reducing the amount of draft blog posts I have as GDPR is at reducing the amount of emails I get. In the meantime however, shedloads of comments on this, or any other subject, are always welcome! Imagine you’re watching a horror film. A woman heads into ancient woods which are shrouded in mist. And before long, she comes across a tree. With an eye stuck to it. Chances are at this point in the film, you’d be shouting, ‘Don’t go in there. Run away!, whilst feeling smugly confident behind your cushion that you’d never be as stupid as to stay hanging around in mist shrouded woods where there are eyes stuck to trees. Well, I was in Leomansley Woods earlier this week. It was shrouded in mist and there was an eye on a tree. But did I leg it? No. And not just because I don’t do running under any circumstances. If something wicked that way had come, I had Finn the swamp dog to protect me and my experience of fighting off a clown in Beacon Park earlier in the month to draw upon. Crucially though, I know and love these woods and consider the tokens and trinkets that have been appearing there since the summer more curious than creepy, possibly symbols of someone else’s affection for them. Back in 2004, when I was a newcomer to these parts, I remember getting a call from my sister telling me to go and take a look in the woods as somebody, or more likely somebodies, had created works of art in amongst the trees. There were mosaics created from leaves and petals, clay faces sculpted onto the trunks of trees and brightly coloured papers hanging from their branches. For reasons I can’t remember, I didn’t take any photographs but I can clearly recall the sense of mystery and magic someone had created in the woods that day. We never discovered who or why and there was no encore. The seasons turned and the years went by and then, early this summer, we began to notice things. At first it was subtle. A pebble placed here, a strip of silver birch bark there. It was the first piece of pottery appearing lodged in the knot of a tree that convinced us this was more than the handy work of squirrels and our overactive imaginations. Dog walks took on a new dimension as every day seemed to bring something new. I’m sure at its peak, others were joining in and making their own contributions. And this time I did bring my camera. As the summer faded, the activity seemed to wane, and I’d assumed there would be no more. The other half took over the dog walks for a while but recently, for reasons involving a prolapsed disc, I took up the lead once again. Many of the original tree decorations had vanished but a handful of hawthorn berries, melted candle wax and a tickle of feathers (that’s genuinely and rather pleasingly the collective noun for them) had taken their place. Interestingly, others seem to be joining in once again, including the Leomansley contingent of the One Direction fan club. Once again, the who and why is a mystery, and perhaps that is how it should remain. Whether activity continues beyond the season of the witch or not, for me, Leomansley Woods will always remain a magical place. I know. It’s been a while. You don’t know what I did this summer but I’d quite like to confess. There have been visits to gibbets, wells, shrines, mausoleums, derelict churches, ruined abbeys, tunnels and places with names which sound a bit rude. It’s less about serious history and more about a series of stories told by the landscape that surrounds us. Sometimes you have to listen very carefully to hear them (especially over the sound of my friend Jacky eating crisps), sometimes they shout in your face via an interpretation board funded by the parish council. If you’re sitting comfortably*, then I’ll begin by sharing** evidence from some of the crime related activities we’ve been getting up to. Once upon a time, there was a little girl called Katie. When she grew up she wanted to be Mavis Cruet from Willo the Wisp. For a short while, she lived in Coleshill in North Warwickshire and almost everyday she’d walk past the town’s pillory. At the time she didn’t realise that it was a rare example combining three methods of corporal punishment i.e. stocks, a pillory AND a whipping post, and was last used in 1863, but she was curious all the same. Many years passed and in August 2016, Katie was visiting her parents in Stone in Staffordshire when she turned off too early towards Hilderstone. This was in no way down to her lack of navigational skills, there was a tree obscuring the ‘Hilder’ bit of the sign. Around the corner was a patch of grass with a set of stocks. Despite extensive research (doing a google search), she couldn’t find any information on them. Katie hadn’t grown up to be Mavis Cruet, but she had continued to be curious. How many more sets of stocks were there around the country? Had anyone ever recorded them? Who had been publicly humiliated and punished here and what were the reasons? Our towns and cities are filled with monuments to the so-called great and good of society. Are these our monuments to those considered petty and bad who lived on its fringes? And so, after musing over these thoughts with friend Patti who already had a knowledge of and interest in this area, they decided to set up a discussion group called ‘Offending Histories’, with the aim of finding remaining physical evidence of crime and punishment across the Midlands and telling the sort of stories in which no one lives happily. Ever after or otherwise. In just a month, we’ve already started to record a fascinating range of sites and objects. Here are some samples of the more local examples. Outside St Michael’s church is the relocated headstone of the last three men to be executed in the city. On 1st June 1810, Neve, Jackson & Weightman were taken by cart from the city gaol & publicly hanged for forgery at the city gallows (where Tamworth St, Upper St John St & the London Road cross). Interesting that at some point, the word ‘hanged’ appears to have been obliterated from the monument. Although this appears to be the only marker to executed criminals buried here, the church register records the names of others e.g. John Wilson on Sept 23rd 1583 and, John Walle and Robert Hodgson described as prisoners executed and buried on 13 October 1587. At St Peter’s in Elford, Patti pointed out this example of a sanctuary knocker on a door dating to circa 1450AD. By touching the knocker, a fugitive from the law could be given sanctuary in the church for a period of time (this seems to have been forty days which is a nice biblical number) . If they made it that far. One example given by Karl Shoemaker in his book ‘Sanctuary and Crime in the Middle Ages’ tells of Elyas, a chaplain imprisoned in Staffordshire to await trial for murder, who ‘killed the gaoler’s attendant, escaped from the prison & fled towards the church’. The gaoler & others from Staffordshire pursued him and cut off his head before he could reach the church’. Another example comes from Colton History Society – in 1270 Nicholas son of William De Colton stabbed Adam, son of Hereward in a brawl and fled to the church where he took sanctuary. Claiming sanctuary was officially abolished in 1623. The Bilstone Gibbet Post, Leicestershire. Erected in March 1801 to display the body of local man John Massey, executed for murdering his wife Lydia and attempting to murder his step- daughter. Massey’s headless skeleton, wrapped in chains, remained hanging from the post for seventeen years, his skull apparently being used as a candle holder in a pub in Atherstone. In the early twentieth century, the post was a venue for religious meetings but today, there are rumours of more unusual behaviour taking place here. Last year, Christine Howles from the Lichfield and Hatherton Canal Restoration Trust and I spent a summer’s evening exploring the Fosseway section of the Lichfield canal. Sharing the photographs on our respective social media accounts generated so much interest that we decided to do it again but with more people and less vegetation. The walk was originally arranged for November but Storm Clodagh had other ideas and so it was on the Sunday after Christmas when sixty five of us gathered outside Sandfields Pumping Station. Dave Moore, stood in front of the door that the Lichfield Waterworks Trust should shortly be getting the long awaited keys to, reminded us all why this building and its contents are such an important part of our local and national heritage. Despite how this might look, I genuinely never tire of hearing Dave talk about Sandfields. Photograph by Eddie Strain. Another part of Lichfield’s industrial past once stood somewhere near here, west of the Chesterfield Rd and causing ‘a great nuisance to the inhabitants of the city’, according to the vicar of St Mary’s in 1806. The ‘noisome and offensive’ bone house was described as being to the north of the Wyrley and Essington Canal. Are their histories intertwined in some way? Did the latter provide a transportation link or even a source of power for the former? Whilst we try and flesh out the history of our bone house, it’s worth having a read about Antingham Bone Mill which stood on the North Walsham and Dilham Canal and appears to have been a similar establishment. From Sandfields, we followed the original line of the canal to the start of the Fosseway Heritage Tow Path Trail. At the site of Lock 19, demolished during the building of the Southern Bypass in 2008, LHCRT directors Peter Buck and Bob Williams described the vision that the Trust has for not only the restoration of the canal in this section but also the creation of a moorings site and a wildlife haven incorporating lowland heath and wetland areas. It has been reported that a hearth and lead musket balls were found near Lock 19, possibly dating to the Civil War. The source of lead for this mini munitions factory can be found a short way along the towpath, where Peter pointed out the headwall to a culvert carrying a pipe beneath the canal. Not just any old pipe though but one that supplied the city’s Crucifix Conduit with water from the Foulwell Springs at Aldershawe, granted by Henry Bellfounder to the Franciscan Friars in 1301. The original pipe is thought to have been made of alder but was later re-laid in lead which it seems those soldiers may have helped themselves to. In 1805, the lead pipe was replaced by a cast iron one made at the Butterley Company in Derby, brought into the city via the canal and offloaded at Gallows Wharf, just as the Herkenrode Glass, recently reinstalled at the Cathedral, had been two years prior. Ferreting around up a historic pipe. At Lock 18, the first site worked on by LHCRT and restored to commemorate the bicentenary of the opening of the canal in 1797, Peter and Bob told us more about the engineering feat that was accomplished here and across the country with tools no more sophisticated than a wheel barrow. Peter told us that during restoration work elsewhere on the route, a brick with a small thumbprint on it was discovered suggesting that children made up part of the workforce. The results of their labour may still be visible but I suspect the details of who they were, where they came from and how they lived, may have disappeared without trace. This section of the Heritage Towpath Trail ends at Fosseway Lane. The bridge here was removed shortly after the canal was abandoned in 1954 and will need to be reconstructed as part of the restoration work. The cottage once occupied by the lock-keeper remains though and still displays the number plate ‘268’ allocated by the Birmingham Canal Navigation Company. We know that in 1923 the cottage was lived in by Mr and Mrs Cass as in October that year, the Lichfield Mercury reported that they had rescued a Hednesford butcher using a canal rake. Charles Peake was driving nine beasts from Tamworth when one broke away near the now demolished bridge. As Mr Peake chased the animal he fell 14ft into the lock. Fortunately, Mr and Mrs Cass heard his shouts and managed to fish him out. Though understandably shaken, Mr Peake was uninjured but the Mercury was concerned others may not be so lucky as on a dark night there was, ‘nothing to prevent anyone who doesn’t know the locality from leaving the road and walking, riding or driving straight into the lock’ and suggested that something should be done to make it safe on the basis that ,’one does not expect to be liable to fall into unprotected death traps in a civilized country’. The Lichfield to Walsall railway line also crosses Fosseway Lane. Although the last train passed by in 2003, the signal box dating back to 1875 remains, albeit in poor condition. As we gathered on the crossing, I was able to tell people about its keeper Emily who kept watch here every night between 1946 and 1963, thanks to a wonderful article about her life and her work shared on Dave Cresswell’s Rail Blog (here) and Brownhills Bob’s Brownhills Blog (here) a couple of years ago. After trespassing on the railway we headed down Fosseway Lane, stopping just before the junction with Claypit Lane to see Sandfields Lodge, where a private lunatic asylum operated between 1818 and 1856. A series of visits by commissioners in 1846 revealed series of deficiencies in the provision of care at the Sandfields Asylum (you can read a transcript of the Commissioners’ Report here) and it was finally closed in 1856 after having its licence revoked due to the poor conditions. We know that the asylum was transferred here from St John Street and it may be related to the one established on that street in 1775 by a physician named George Chadwick. More research is needed into this and perhaps also into the reasons why by 1788, Chadwick had confined his wife to her room on the basis that she was a ‘lunatic’. From Fosseway Lane we walked along Falkland Rd and the new route of the canal to the Birmingham Rd roundabout where a tunnel has been constructed and temporarily buried (see we really do have secret tunnels in Lichfield!). After passing beneath the Birmingham Rd, the canal will cross under the Lichfield to Birmingham Cross City railway line via a new tunnel, scheduled to be constructed at Christmas 2017. With the weather on the turn, the real ales and real fire at the Duke of Wellington beckoned. En-route we passed another old pub, now Redlock Cottage but once known as the Board and later as the Spotted Dog. At this stage though, it was an open pub we were all really interested in. We know the Welly was definitely an inn by 1818 when the landlord is listed as Thomas Summerfield but the early history is sketchy. I have seen it suggested here that it began life in the mid eighteenth century as a slaughter house and only later became an inn to take advantage of the passing trade brought by the canal. It was of course the canal which had brought us here too, for beer, tea, crisps and dog biscuits (Doug the Dog definitely deserved his!). A fitting end to a great walk at the end a great year. Thanks to the Lichfield Waterworks Trust, the Lichfield and Hatherton Canal Restoration Trust, Steve Martin and Eddie Strain for the photographs and of course everyone who came along. Happy New Year and here’s to plenty more of this kind of thing in 2016. Make sure you follow us all on Twitter @lichdiscovered and @LHCRT1 and on Facebook here, here and here so you don’t miss out! 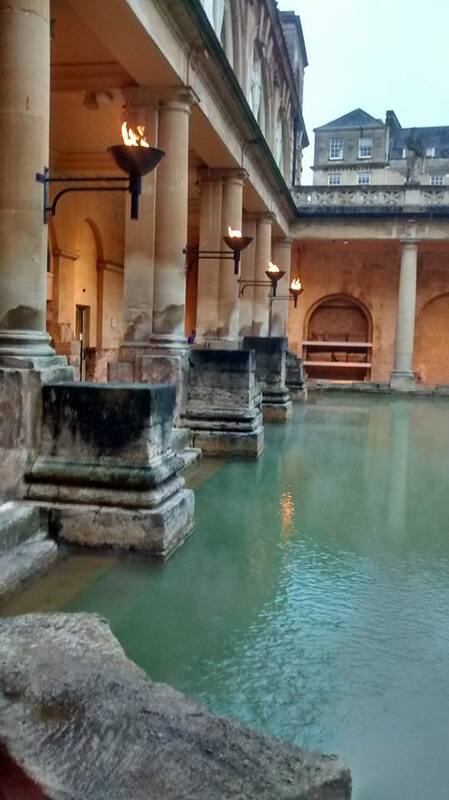 Although the waters at the Roman Baths in Bath were once known for their healing powers (the mythological Prince Bladud and his pigs are said to have been cured of leprosy after wallowing here in 863 BC), the water is now considered unsafe and is strictly off limits. This didn’t bother me in the slightest as I’d much rather be issued with an audio guide with commentary from Dr Alice Roberts than a fluffy white bathrobe. The great bath is fed by a hot spring rising here at the rate of 1,170,000 litres a day and a temperature of 46 degrees Celsius. For our ancestors, the warm water gushing from the ground was the work of the gods. Even though I know the cause to be natural rather than supernatural, there was still something magical about watching vapour swirling up out of the bubbling, green-hued water into a torchlit, grey November afternoon. And it seems I’m not the only one the place has that kind of effect on. When the Romans arrived, the local goddess Sulis was already being worshipped here so they named the place after her, and built a new temple honouring both her and her Roman counterpart Minerva alongside the sacred spring. Alongside the curing, a fair bit of cursing went on. One hundred and thirty prayers inscribed on sheets of lead or pewter were thrown into the spring between 200 and 400 AD. Many invoke the help of Sulis Minerva in seeking justice and revenge for heinous crimes such as the theft of a bathing tunic or gloves. The majority are in vernacular Latin, but one as yet untranslatable text is thought to be the only surviving example of an ancient British language. I quite like the thought that the only physical trace of something spoken thousands of years ago was not left by kings or queens but by one of the plebs like us, most likely complaining that their swimming costume had been nicked. In 1727, the gilt bronze head of a statue of Sulis Minerva was discovered yet it’s not the face of the goddess which has become the symbol of Roman Bath but the face of the ‘gorgon’ found on the pediment outside her temple. And I have the fridge magnet to prove it. Re-discovered in 1790, and debated ever since, the ‘gorgon’s head’ is surrounded by a sea of symbolism including Tritons, a dolphin head shaped helmet, a star, an owl and two Victories. 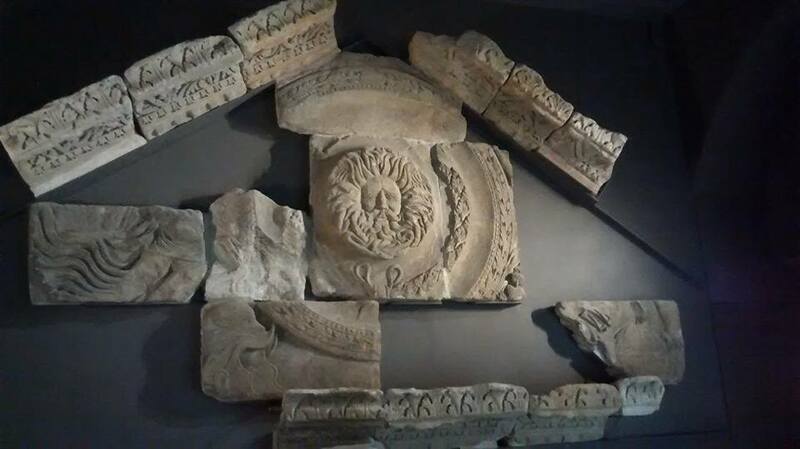 The ‘gorgon’ interpretation derives from the association of Minerva with Medusa and the supposed presence of a couple of snakes in the beard. Yes this ‘gorgon’ has a beard, which highlights the main problem with this explanation – gorgons are female whereas this is obviously the face of a man. It might be another example of the Romans combining a local god with of their own e.g. a classical gorgon and a British water god or could perhaps even be Neptune or Oceanus. The so-called gorgon at Bath. I’m not convinced. But then I dropped Latin in the third year, so what do I know? Other more easily identifiable gods found here include Jupiter and Bacchus whose images once formed part of the great altar where sacrifices were made. 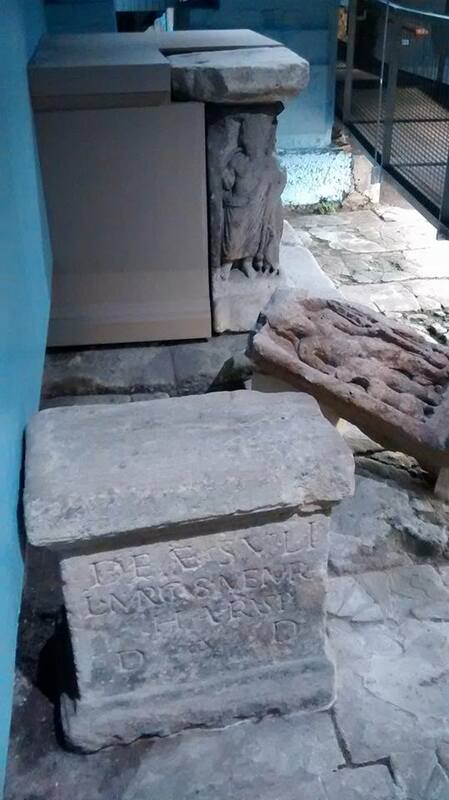 Post-sacrifice, the entrails of the animal were consulted by a haruspex (literal translation: gut-gazer) and we know there was one here in Aquae Sulis because the inscription on this stone reads ‘To the goddess Sul, Lucius Marcus, a grateful Haruspex, donated out of his devotion’. This is the only evidence we have of a priest in Britain who practised divination in this way, so it’s something of a rarity. It has been suggested that whoever carved the stone wasn’t all that competent, originally missing out the ‘O’ from ‘Memor’ and also having to squeeze the letters ‘VSP’ after ‘the abbreviation HAR’. You’d think Lucius might have forseen these problems in the intestines. Hopefully, all this talk of Romans at Bath will have whetted your appetite for something a little closer to home but just as exciting. Not only does our Roman site at Wall have carvings every bit as mysterious as those at Bath, evidence of Christianity in the area prior to St Chad’s arrival (in the form of bronze bowl with a Chi-Rho symbol which you can see and read about here) and even rumours of our own statue of Minerva said to have been as big as a man, but not a man as it had a bust but also not a woman because it was wearing a soldier’s helmet. Unfortunately, it was used to fix a drain. If it ever existed in the first place that is. 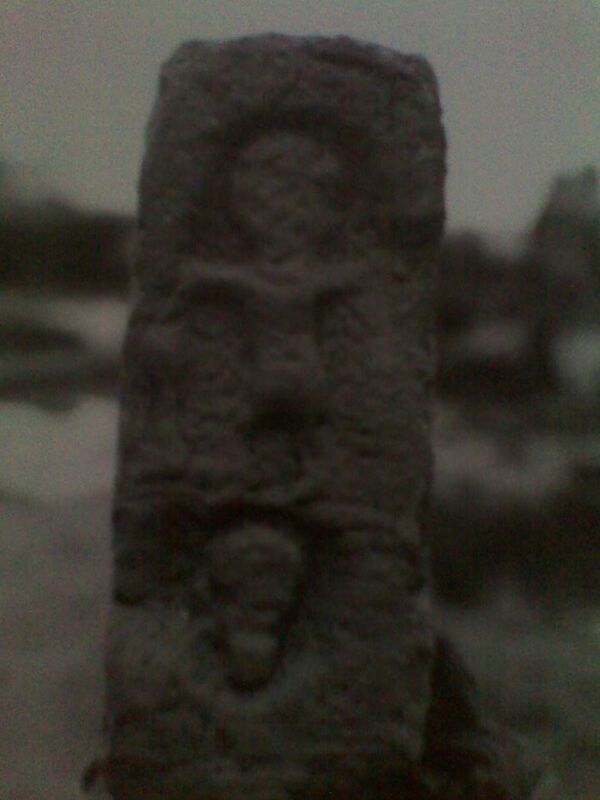 Possibly one of the local gods at Letocetum. Found built into the walls of the Mansio at Wall. 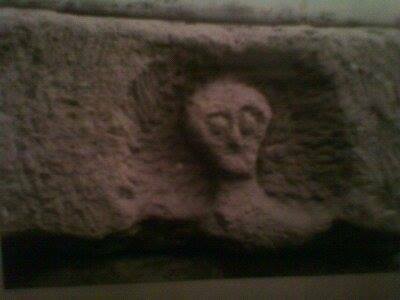 This may represent a skull in a niche a la Roquepertuse or it may be another local god. We just don’t know but it is fun speculating. 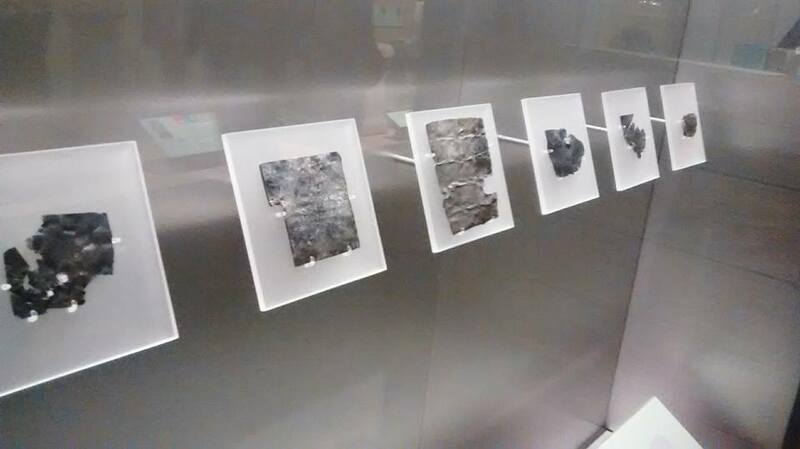 You can access the site of Letocetum all year round during daylight hours and the museum is open 11am to 4pm the last weekend of every month plus Bank Holidays between March and October. This Winter, the Friends of Letocetum have arranged a series of talks at Wall Village Hall starting on Wednesday 9th December with Dr Mike Hodder who will be talking about his own personal experiences as an archaeologist at Wall. Further details of this and all other upcoming talks and events plus lots of other information about Letocetum can be found here on the website or there is a Facebook page here and you can follow @FndsofLetocetum on Twitter. For anyone who would like to see the Gorgon’s Head but isn’t able to get to Bath, it will be coming to a lampost in Leomansley shortly along with a wobbly lobster. Details on request. And should anyone pinch it, I’ve got a curse ready. You’ve probably heard about the exciting developments in the Lichfield Waterworks Trust’s campaign to save Sandfields Pumping Station for the community. If you haven’t a) where have you been all weekend? and b) please take a look at chairman Dave Moore’s recent announcement here and a great post from the ever supportive Brownhills Bob here. Sandfields Pumping Station. If you still don’t know where this amazing place is, tell me and I’ll take you there myself. You probably won’t be surprised that I want to add my two penn’orth. For all its tangents and diversions, this is essentially a blog about Lichfield history and to be able to write a post saying that we are now going to be actively involved in preserving and promoting one of the most important architectural, industrial and social heritage sites in the city (and indeed country)…well, let’s just say I’ve had to pinch myself a few times. 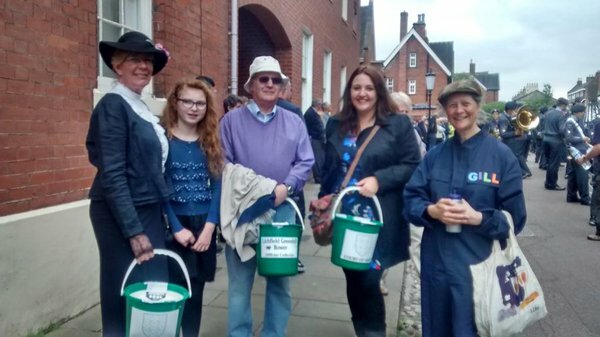 On 19th September 2015, the Trust took part in the Lichfield Heritage Weekend with three water themed walks around the city and a display in the museum at St Mary’s. We wanted to share the story of how Lichfield supplied clean drinking water to the Black Country during the cholera epidemics of the mid-nineteenth century and to highlight the heroic role Sandfields Pumping Station and its now unique Cornish Beam Engine played in this. Rather fittingly, the theme of the 2015 weekend was ‘Making History’ as here we are just five weeks later, in a position to do exactly that. I’ve been grinning from ear to ear since I heard the news. Congratulations, thanks and respect must of course go to chairman Dave Moore and the other members of the Lichfield Waterworks Trust for their tenacity, dedication and hard work but also their optimism, vision and ability to talk me into wearing a boiler suit in public. Thanks also though to those of you came who came on a water walk, sent us a photo of a Stowe Pool sunset, visited John Child’s amazing model of a Newcomen engine at our stall in the Festival Market, lent us your name in support, picked up a leaflet, got really excited when you heard about the Hanch tunnel running below your feet, chucked your two penn’orth worth in our bucket during the Bower Procession and showed us in many other ways that you cared deeply about not only the past but also the future. As David and Bob both rightly say, the real hard work starts here and we’ll need your ongoing support as we embark on a new chapter in Lichfield’s water story. I’m hoping it’s going to be ‘Sandfields Pumping Station – built for the community and saved for the community by the community’. Sounds like a great way of making history to me. 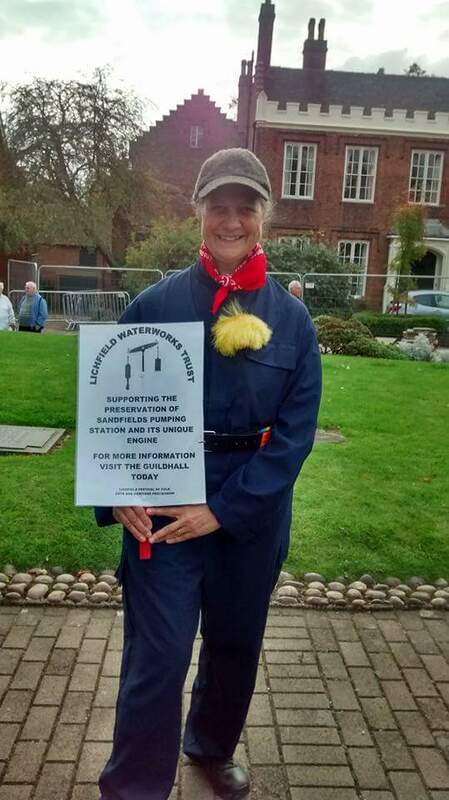 A beaming Gill from the LWT on last week’s Arts & Heritage procession (she carries the boiler suit look off much better than I do). 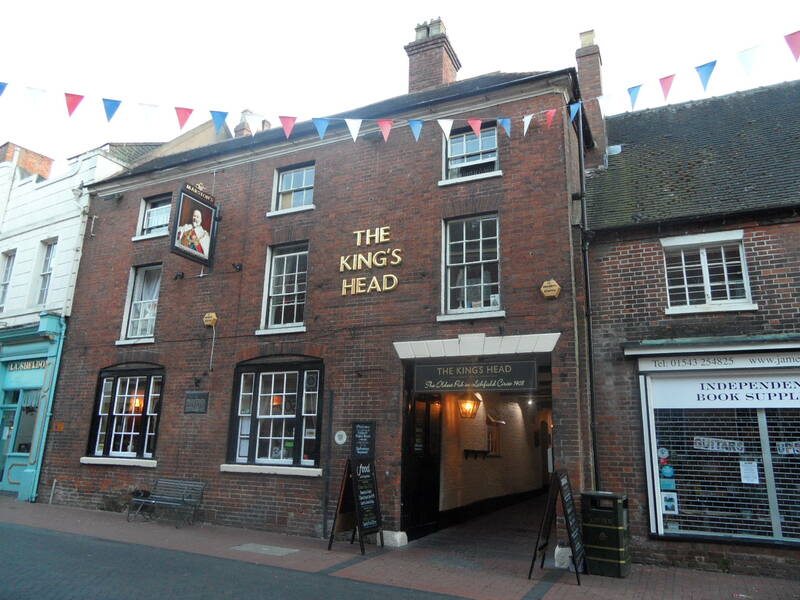 Our Lichfield Discovered monthly meet-up is at the King’s Head on Bird Street tonight (Tuesday 8th September). It starts at 7.30pm but don’t worry if you’re late, just join us when you can. We’ll be there for a while….We’ve got plenty to talk about including plans for our Halloween get-together at a suitably historic location just outside the city, the possibility of a garden archaeology project next year and we’ll be chucking around ideas about some experimental local history (this may or may not involve charabancs). We need to have a bit of a chat about the future direction of the group and of course, there’s bound to be general chatter about all things Lichfield. These meet-ups are informal, open to everyone and you can get involved as much, or as little as you’d like. You can come along and have a say in what we do and how we do it, or you can just come along and say ‘hello’. There’s no obligation to come every month, just as and when you want to. As ever, the best place to keep up to date and get in touch is on twitter @lichdiscovered or like our Lichfield Discovered Facebook group.